Good evening! 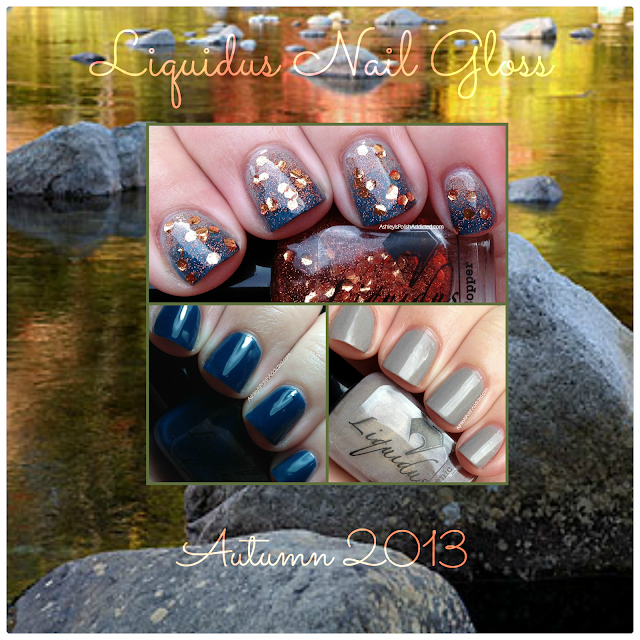 I have the Fall 2013 collection from Liquidus Nail Gloss to show you tonight! Stay tuned until the end of the post for a discount code from Liquidus! Liquidus creator, Danielle, loves geology and all of the polishes she creates are inspired by rocks, gems and minerals. They are 3-Free and all polishes ship in ecofriendly packaging that can be composted and is 100% biodegradable. 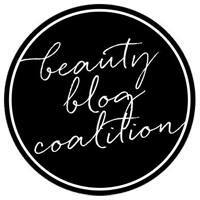 You can tell a lot of love and thought goes into this brand! 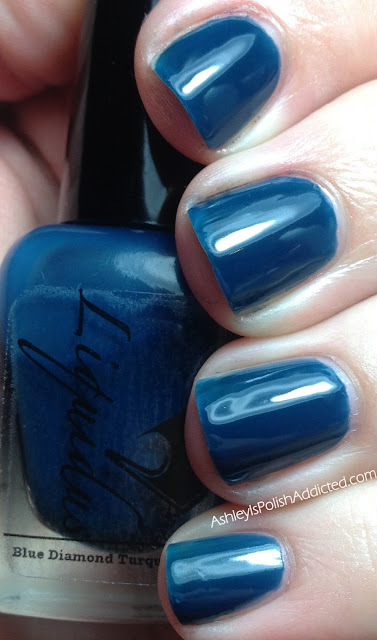 The polishes I have for you tonight are Arsenic, Copper and Blue Diamond Turquoise. 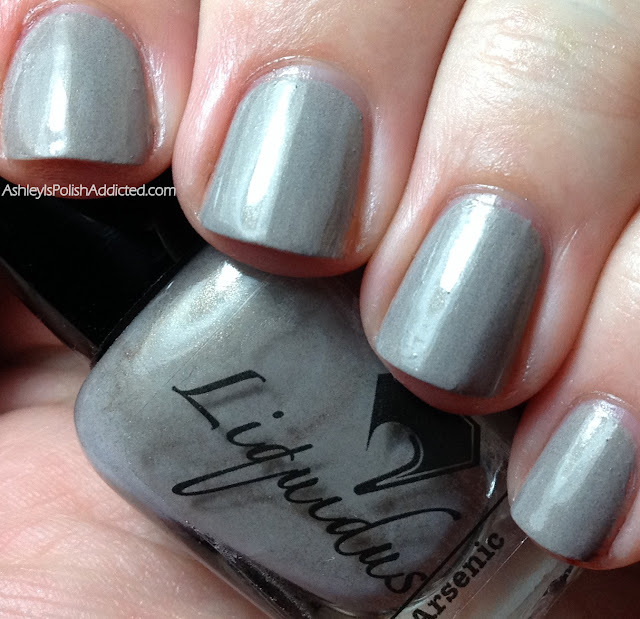 Arsenic is a lovely grey creme with a hint of copper and yellow shimmer. 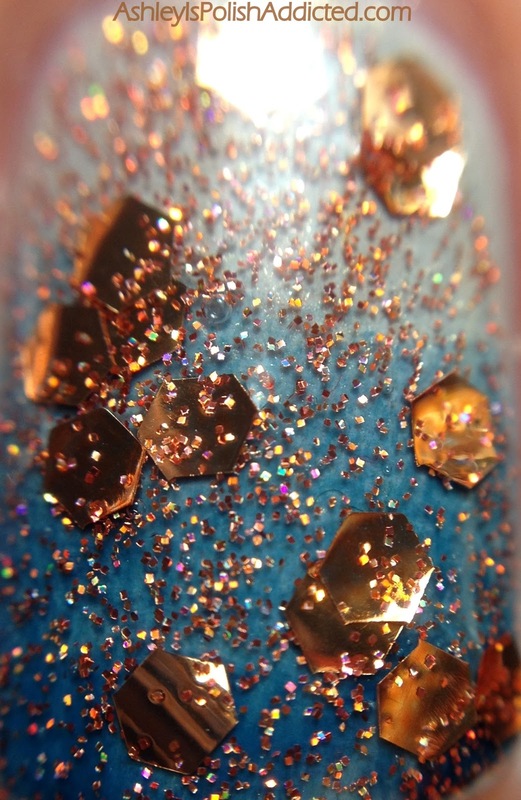 My camera did not want to capture the shimmer at all (though you can see it in the macro pic). The shimmer is more visible in person but is not overpowering. Very pretty and work appropriate. Formula was creamy and smooth. I used 2 coats and no topcoat for the photos. 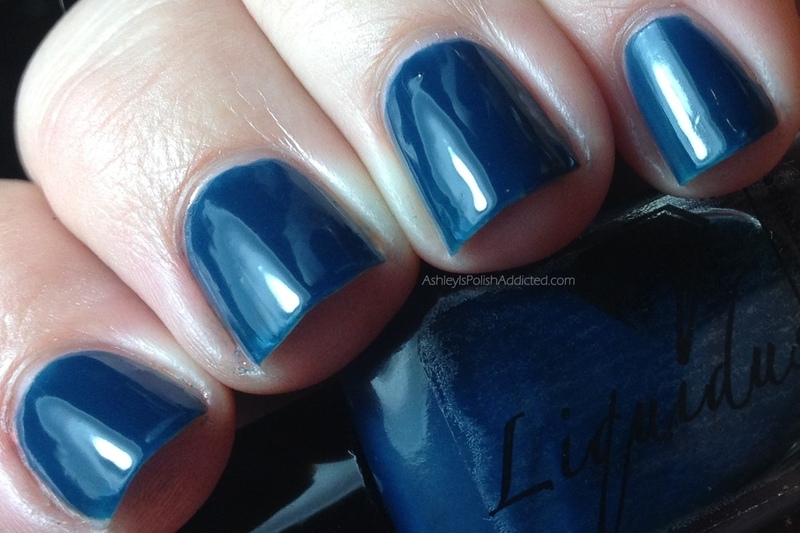 This one is a gorgeous dark teal crelly. It is slightly more green-toned than my photos show. Formula was great and it is super shiny on its own. 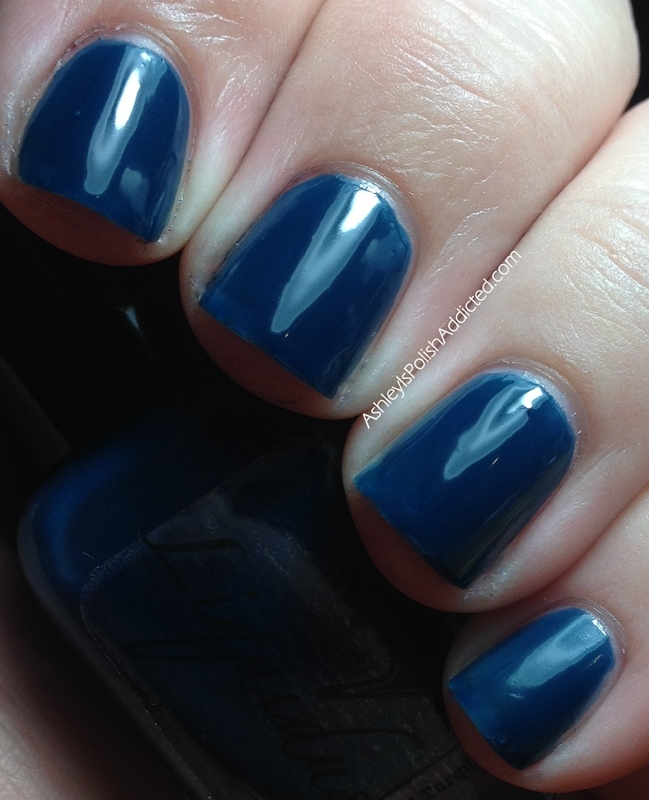 2 coats and no topcoat for the photos. 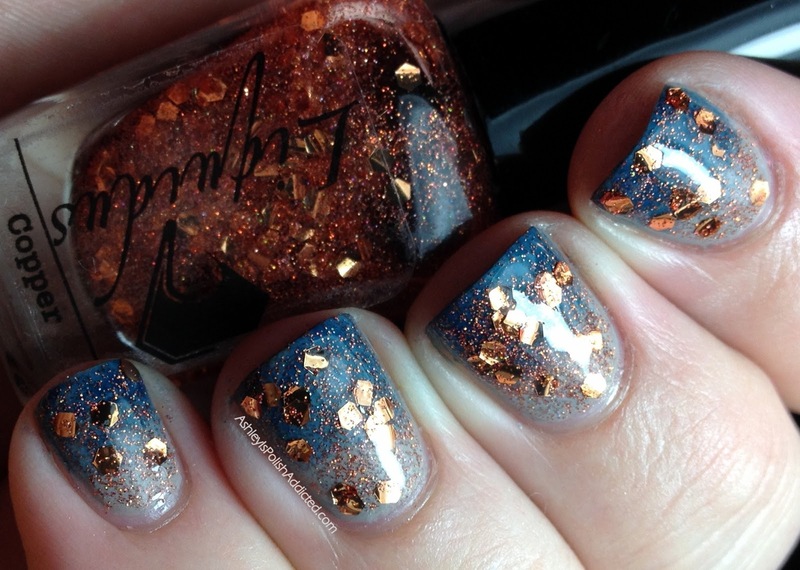 Copper is amazingly sparkly and definitely a must for glitter lovers! This is so much more blingy than I could capture. When I first received it I was afraid that the glitters might be starting to curl, and you can see what looks like curling on my nails, but I assure you they are not curling. I took them out and examined them with a magnifying glass just to make sure. What you see is a reflection of the shine that makes it look like curling. 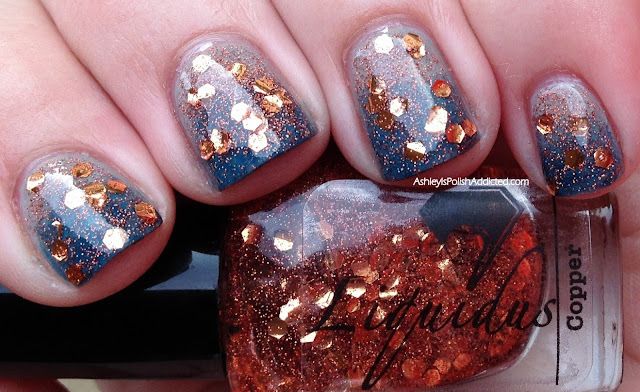 And the base of this polish is just so pretty; the holographic and copper microglitter/shimmer is just stunning. I am showing one coat over a gradient of Arsenic and Blue Diamond Turquoise, one coat of topcoat. What do you think of these? I think my favorite is Blue Diamond Turquoise but I really like them all! Now for the discount code! 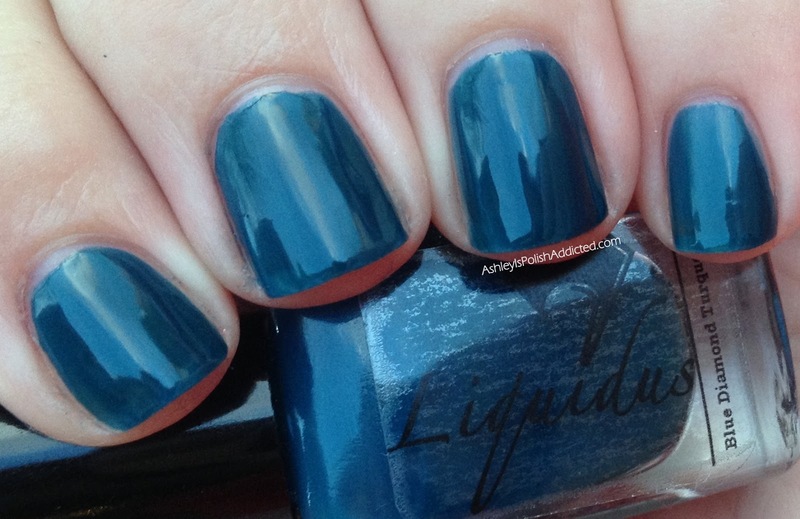 Use code POLISHADDICTED10OFF to receive 10% off your purchase from Liquidus. Arsenic is GORGEOUS!!!!!! I love polishes like those. And your gradient with the glitter is super pretty. omg! the glitter is sooooooooooooooooooo gorgeous! 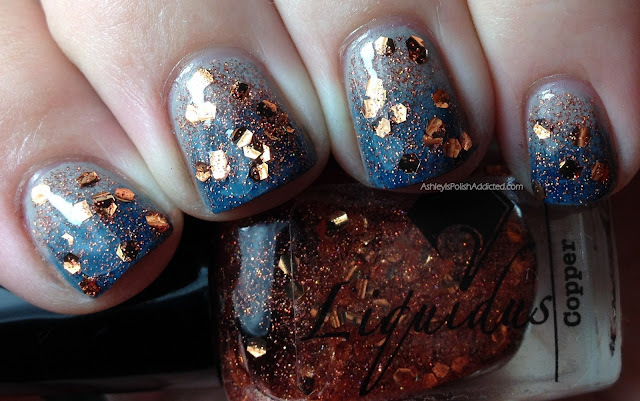 I love Arsenic and Liquidus Copper. Such pretty polishes. Copper! 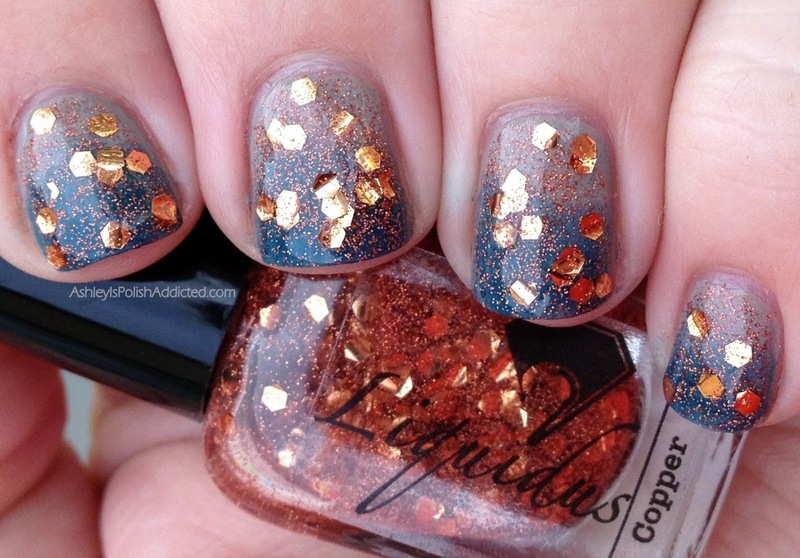 That glitter! I need this in my life. *runs to Etsy* It looks magical over that gradient. So autumn-y.